Red currant, Ribes rubrum, East Sussex, July. Photo: Paul Kirtley. Red currant, (or redcurrant), Ribes rubrum is a member of the Gooseberry family, Grossulariaceae . Its fruits are edible and it is relatively easy to recognise and distinguish from other species. 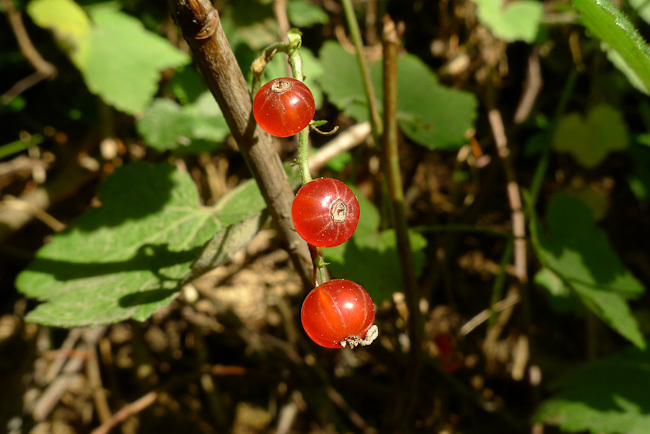 Red currant is native to parts of Western Europe but is also widely cultivated, with some wild populations being formed by naturalised escapees. 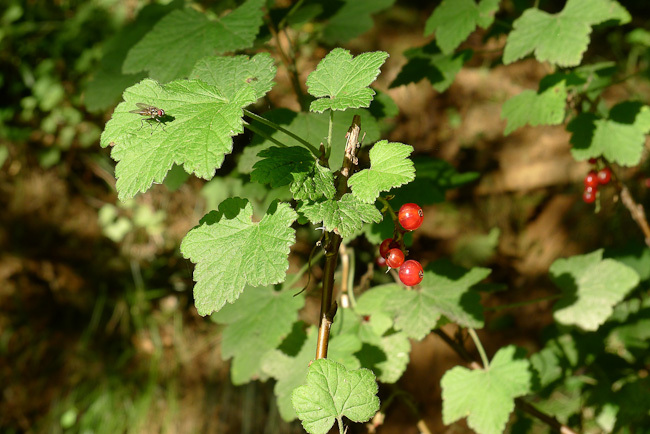 Red currant tends to grow in isolated but dense stands. 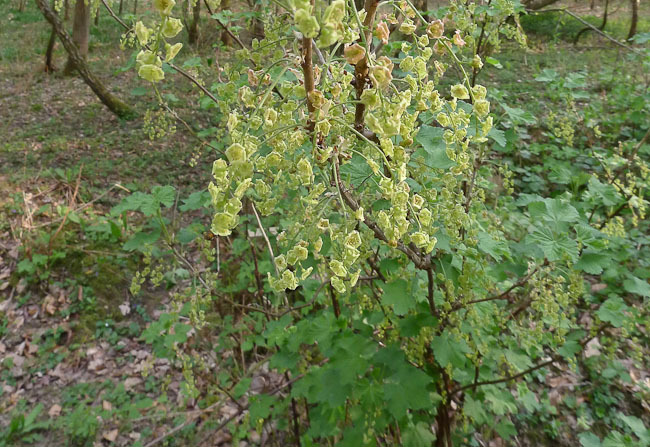 It is typically found on river banks and in damp, shady deciduous woodland, often associating with Alder, Alnus glutinosa. In the UK the species is widely distributed but grows most commonly in the southern half of England. 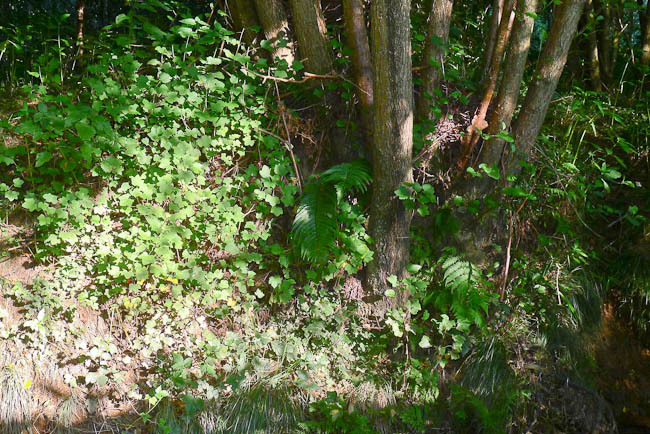 A dense stand of red currant, Ribes rubrum amongst willows and alder. East Sussex, May. Photo: Paul Kirtley. 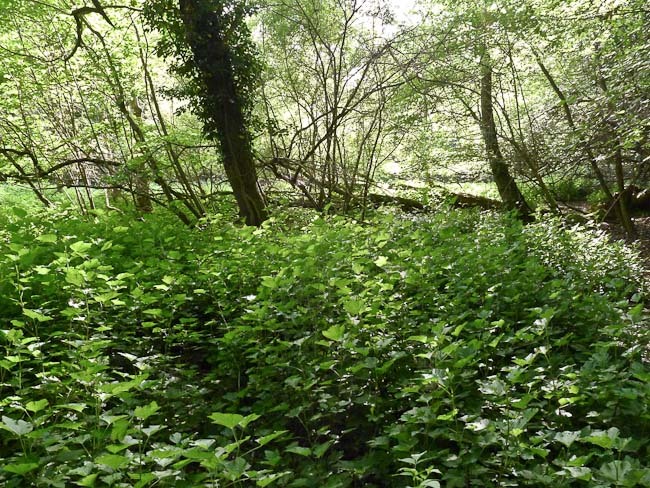 A stand of red currants next to alder trees on the bank of a stream, East Sussex. Photo: Paul Kirtley. The plant is an upright deciduous shrub, typically growing 1.0 – 1.5m in height, sometimes up to 2.0m. 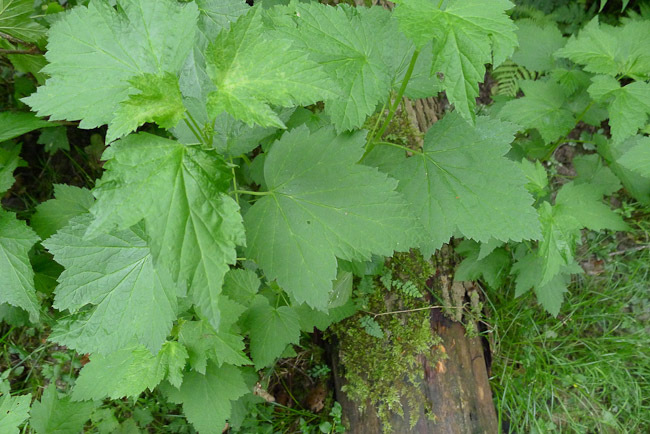 It has a woody stem and bluntly-toothed, palmate leaves with 3 to 5 lobes, somewhat reminiscent of a maple leaf. The leaves of red currant, Ribes rubrum, East Sussex, June. Photo: Paul Kirtley. The flowers, which are present April to May, are a fairly uninspiring yellowy-green, small and not particularly noticeable. The flowers themselves and the racemes they grow in help identify them as Ribes though. The somewhat dowdy flowers of red currant, Ribes rubrum, April, East Sussex. Photo: Paul Kirtley. In clusters of up to 20 shiny berries – at first green then bright red – drooping strings of fruit form where the flowers once were. The fruits are round, almost spherical and 6-10mm in diameter. They have translucent skin and you can sometimes see the pips inside. Like gooseberries they have ribs like lines of longitude on a globe. Red currants, Ribes rubrum, develop drooping strings of fruit. East Sussex, July. Photo: Paul Kirtley. Gooseberries growing on the banks of the French River, Ontario, Canada in July. Here the family resemblance (lobed leaves, woody stem and berries with ‘lines of longitude’) is clear. Photo: Paul Kirtley. The berries are edible. They are sweet, being a good source of glucose, fructose and sucrose but also rather tart. They are quite acidic containing, amongst other acids, a significant amount of ascorbic acid (Vitamin C), with a concentration of about 40mg/100g fruit. Also of nutritional interest is red currants containing a significant amount of pyridoxine (one of the chemicals that can be called Vitamin B6). The fruits are typically ripe in July and into August. Birds and small mammals are fond of them and the berries usually quickly disappear as they become ripe. They are easily collected and make a great wayside treat. If you are collecting to take some home, there are all manner of recipes which incorporate red currants to choose from. Black currants, Ribes nigrum, are much less common than red currants but the plants look very similar. Without the berries present, you can tell the difference between red currants and black currants by the smell of the leaves. Black currant leaves smell strongly of black currant cordial, while red currant leaves are unscented and just smell “green”. It should be noted that the guelder rose, Viburnum opulus, despite growing to a much larger size than red currant plants, is also a shrub with lobed leaves and red berries. Therefore there is some potential for confusion. Guelder rose can also grow in the same habitat – I have certainly seen guelder rose growing alongside red currants in a damp alder wood. Unripe berries or a large number of ripe berries are mildly poisonous and can cause vomiting and diarrhoea. Apart from the difference in stature of the shrubs, guelder rose fruits grow in bunches more like elderberries, Sambucus nigra and the individual fruits themselves have opaque skin and look more waxy than redcurrants as well as lacking a “tail”. How is it near you? If you’ve found red currants while you’ve been out and about recently, let me and other readers know: Are they ripe where you are? Has it been a good crop there too? Hello Paul, great article. I have come across redcurrants in woods near me recently(Gloucestershire),they were ripe but did not have much of a crop on them,i have blackcurrants in my own garden which are ripe now but have failed this year to yield a good crop too. Thanks Paul. I thought this article was about red current/tide first! :S Here in the Netherlands, I haven’t seen these redcurrants here, although they are here, known as ‘aalbes’ I have seen the guelder rose though, but never felt to sure about the berries. Thank you Paul, for this great article. Thanks for another fascinating article, Paul. I’ve learnt something new as always. For instance, I hadn’t realised that redcurrant leaves didn’t smell like black currant. I personally find them a bit too sharp to eat raw but you can always cook them with something sweet. However, I’ve no idea what you’d find in the wild that was naturally sweet except honey, which has its challenges. Interesting. I wonder if the birds and mice have got to the redcurrants first? They normally do when they get ripe. A few places where I’ve found them, they certainly had. In others, they disappeared quickly (I left some to go back to). Another great one Paul, there is a lot of suspicion about wild fruits these days and people do not pick them as they used to. Some Redcurrants here in Leicestershire, but the local crop is not very good surprisingly. I find them a bit sharp for my taste, nice cooked with something sweet though! Blackcurrant boom here, my daughter and I lunched for free last weekend in the woods. Good to hear you’ve had some fruit, even if it hasn’t been redcurrants. When I was younger, I used to see people picking fruit along the hedgerows as I cycled past. Now I see hardly anyone doing this. Strange as we are told that there has been a resurgence in interest in wild foods. I think the interest is there but you are right, many people are still suspicious or, more to the point, don’t trust their own judgement. Yes, I’ve found redcurrant crops this year from my two spots I know of in Kirknewton and South Queensferry. I wasn’t too hopeful to be honest, because of all the wet weather (all berries and fruit need rain of course) but despite the deluge and these bushes being South facing, its been a bumper crop. I only used what I needed for a jelly for both pork and turkey dishes – delicious – and left the rest for the birds. Interesting to hear it’s been a “bumper” year up there. It’s been good down here too. Hope you manage to save some of your jelly until Christmas…. 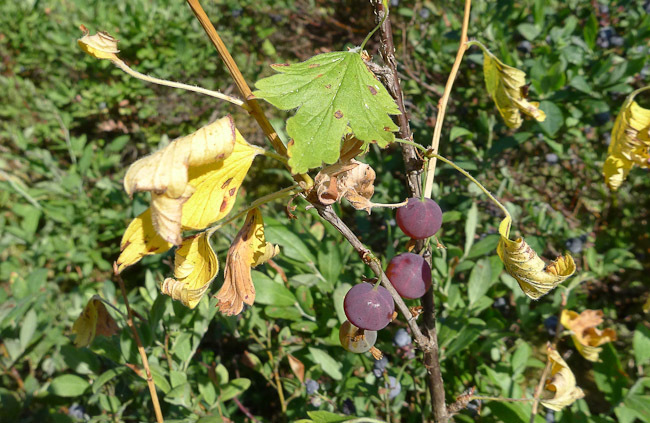 Great article but we need more on fruits that we can forage closer to home! I have a couple of lovely parks near my home in London and they are chokka with hedgerow plants that are fruiting after this bumper harvest year. I have foraged lovely blackberrys from which I made jam (I picked 6.5pds of fruit and it didn’t even DENT the bounty that was on offer) and will attempt this year to make rosehip syrup but there are two other fruits on offer – ones that look like redcurrants and ones that look like blackcurrants. 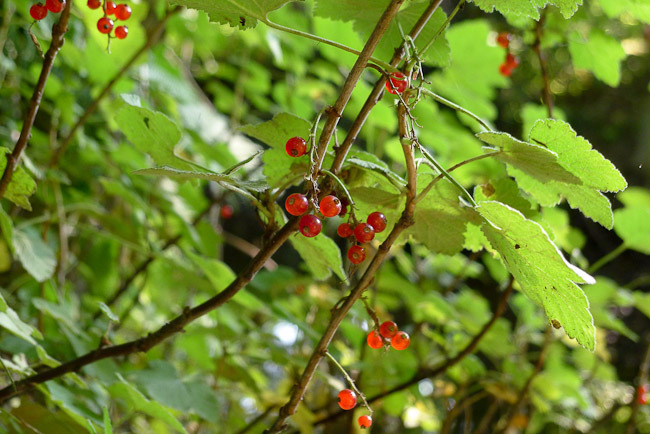 Your article above was really helpful, as I now suspect the red ones are Guelder Rose bushes, so I won’t be picking those; but the other ones could be blackcurrants, and how do I tell if they are what they appear to be and not some potentially poisonous wannabe fruit? I am a city-dweller who wants to learn how to forage for stuff in a suburban context – what can we find and where do we look? Can you help? All the very best! I found some today whilst collecting birch bark from a fallen tree (i make birch tar) and they made a very refreshing snack. Out of interest what are you making the birch tar for? well, I’ve tasted the French River area gooseberries and if these are the same, my mouth is salivating at the back just thinking of them. Nice article. They are a bit different but equally worthwhile seeking out. Thank you for the information. You’ve just helped me to confirm that the ‘red currant like’ berries that I have foraged are in fact guelder rose. Thank you for this article. We found and picked a bunch of red berries thinking they were red currants. But it turns out they are the berries from the guelder rose – and I never would have known had I not read this article. You saved me! 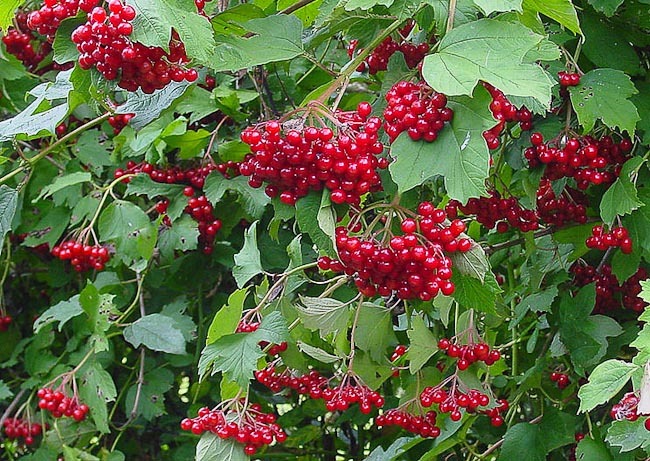 I’ve just eaten a little bunch of the guelder rose berries-to test, though I felt sure they were redcurrants. Thanks for your article:the rest will go in the bin.